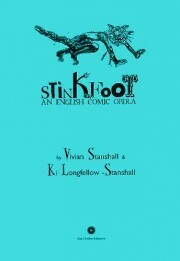 Stinkfoot is a musical comedy, or, as Vivian Stanshall would have it, an English Comic Opera In The Grand Tradition. Stanshall (1943-95) wrote it together with his wife, Ki Longfellow-Stanshall, for their Old Profanity Showboat in Bristol, where it was staged by the Crackpot Theatre Company in December 1985. This book documents these shows. 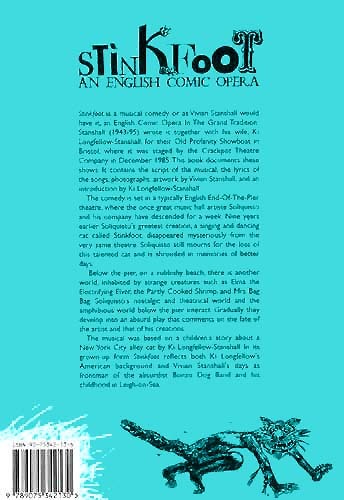 It contains the script of the musical, the lyrics of the songs, photographs, artwork by Vivian Stanshall, and an introduction by Ki Longfellow-Stanshall. The comedy is set in a typically English End-Of-The-Pier theatre, where the once great music hall artiste Soliquisto and his company have descended for a week. Nine years earlier Soliquisto’s greatest creation, a singing and dancing cat called Stinkfoot, disappeared mysteriously from the very same theatre. Soliquisto still mourns for the loss of this talented cat and is shrouded in memories of better days. Below the pier, on a rubbishy beach, there is another world, inhabited by strange creatures such as Elma the Electrifying Elver, the Partly Cooked Shrimp, and Mrs Bag Bag. Soliquisto’s nostalgic and theatrical world and the amphibious world below the pier interact. Gradually they develop into an absurd play that comments on the fate of the artist and that of his creations. 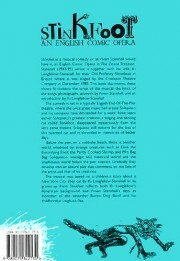 The musical was based on a children’s story about a New York City alley cat by Ki Longfellow-Stanshall. In its grown-up form Stinkfoot reflects both Ki Longfellow’s American background and Vivian Stanshall’s days as frontman of the absurdist Bonzo Dog Band and his childhood in Leigh-on-Sea.